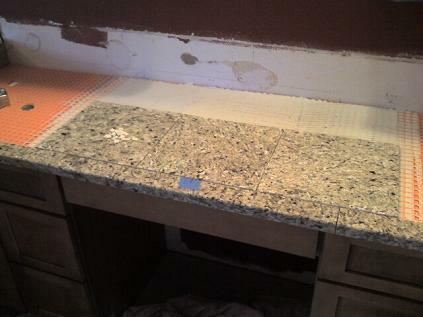 Here is a Granite tile counter top project we completed as part of a full master bathroom remodel in Wesley Chapel “Tampa”, Florida. 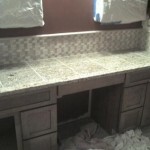 The old shower tile was removed and ripped down to the metal studs, the shower floor tile and mud bed was removed, the main floor tile was removed, cabinets, mirrors, lights, old counter top and toilet all removed. 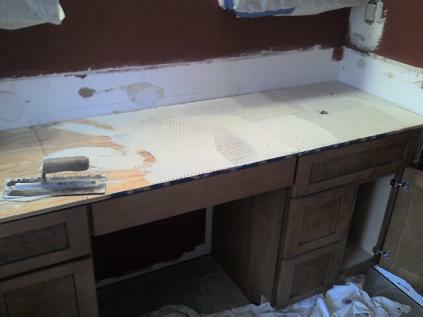 Everything in the bathroom was removed except the drywall. 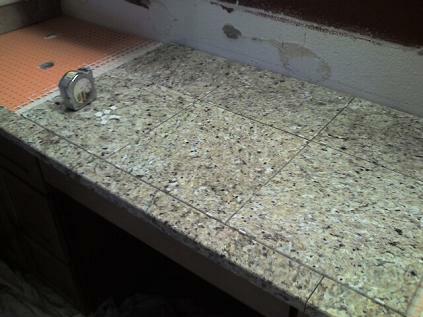 We tiled the shower walls and shower floor along with the main bathroom floor the week prior. 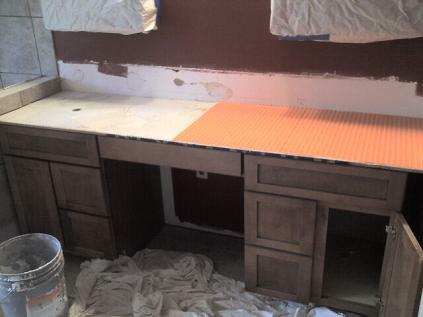 Now that the new cabinets were installed, mirrors up and paint done we can proceed with the last bit of tiling…… the counter top and back splash. 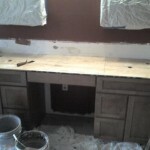 We Installed new 3/4″ plywood as the base for the counter top install and we glued and screwed it into the cabinet anchoring it firmly. 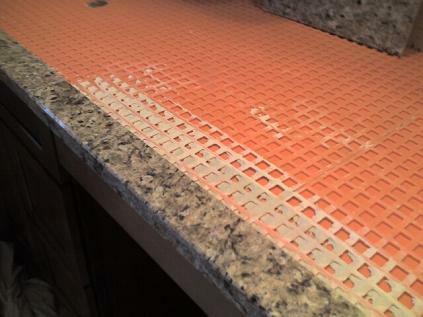 We elected to use Schluter Ditra instead of cementboard for this install as our tile substrate since we had some leftover from a bathroom floor install we did. 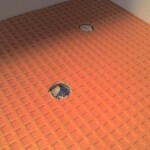 Schluter Ditra is an uncoupling membrane that will allow the tile to move slightly with thermal changes. 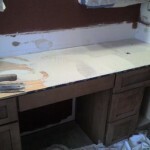 It is also only an 1/8″ thick, if we had used a 1/4″ cementboard a small part of the plywood would have shown under the granite counter trim we were using. 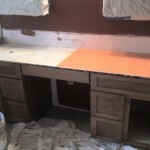 We installed the Ditra with 1/4″ notched trowel rather then the suggested 3/16″ notch and used a Modified thinset called Versabond from Custom Building Products. 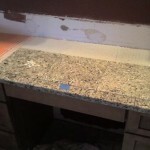 We first installed the 3″x 30″ granite counter trim on the edge first. 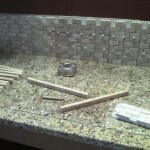 It took only 3 pieces with each side cut off a little on the wet saw. 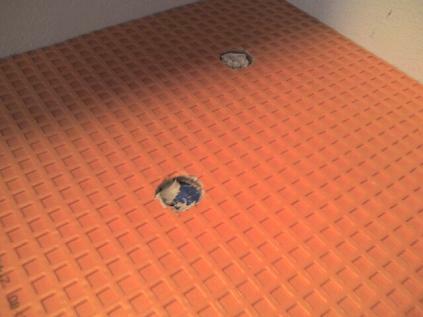 We did the layout and decided to centered the first tile since the side cuts would be about 3/4 of a full tile on each side. 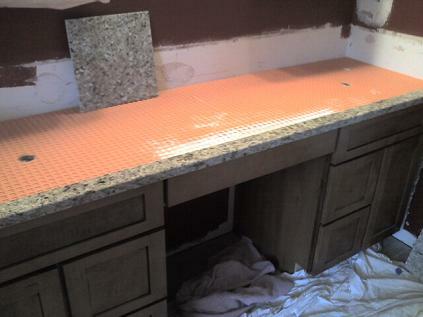 We used the same modified thinset to set the tile even though Schluter wants you to use a Un Modified. 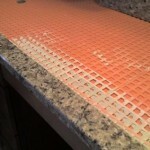 This is so the thinset can hydrate properly and cure, a Modified thinset needs air to dry and really cant between the tile and the Ditra. 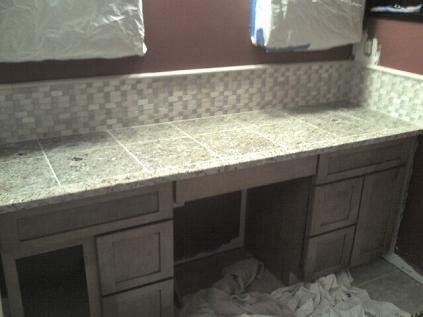 But we were giving it a few days to dry over the weekend before we caulked and grouted it. 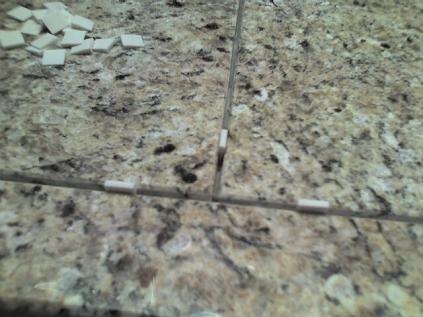 The homeowner wanted a sanded grout joint so we used 1/8″ wedge spacers, this and the micro bevel on the granite tile once grouted would give you a nice 3/16″ grout joint. 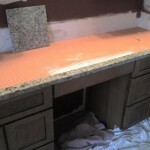 Once the Granite tile on the counter top was done I started on the back splash with the mosaic tile and a mixture of tumbled 1″x2″ travertine and 1″x1″ aqua opaque glass tile. 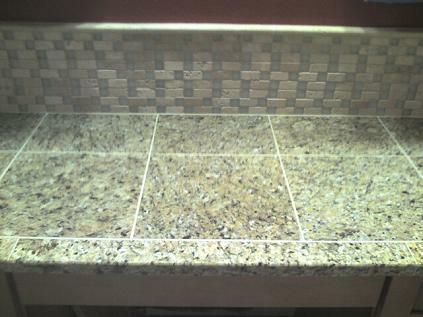 We sent the homeowner to one of our local tile distributors called Floor & Decor and had them pick out the tile selection. They have 6 locations in Florida and 3 are close to me in Tampa/Brandon, Clearwater & Orlando. 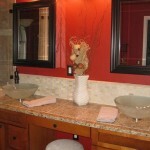 They were happy with what they picked out and gave us an idea of what they wanted and we installed it. 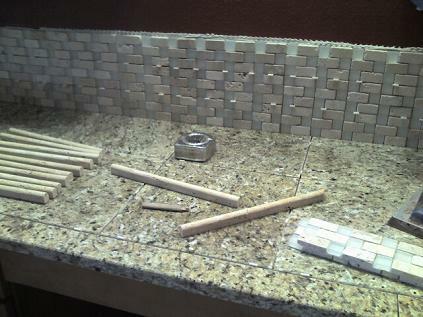 I decided to install the mosaic as a stacked pattern and not the zig zag it was designed for. 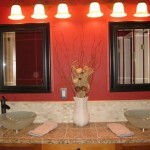 We used the same style in the shower as the accent band and the homeowner liked the look better since it was different. 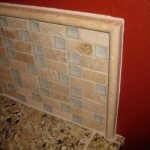 They also purchased a 3/4″x12″ travertine dome liner to be installed at the top of the small splash it would give it a matching finished look. 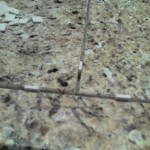 Once the thinset was dry from sitting through the weekend we grouted the travertine & glass mosaic and the granite tile with a grout from Custom Building Products called Antique White #10 Polyblend Polymer-modified, sanded Portland cement grout. We also used the matching sanded Polyblend caulk at the change of horizontal plane and in the corners as a soft joint for movement. 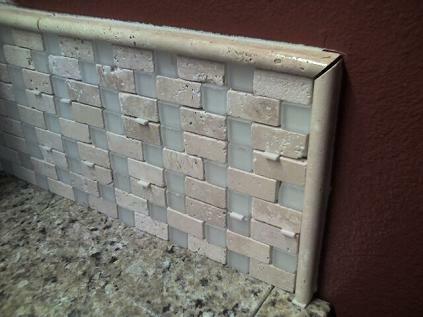 Sanded grout would crack over time from slight movement if used in the corners. 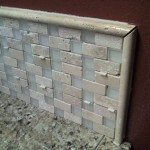 Once the grout was dried the owners applied a couple coats of TileLab Matte Sealer & Finish. 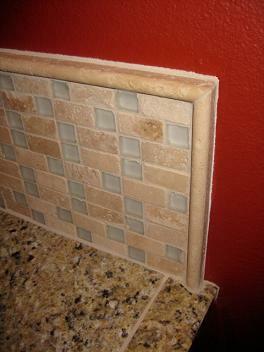 This would seal the travertine & grout but not enhance the color of either. This sealer is also a “Custom Green Product” and has low VOC’s (Volatile Organic Compounds). 220 grams of VOC per 1 liter. 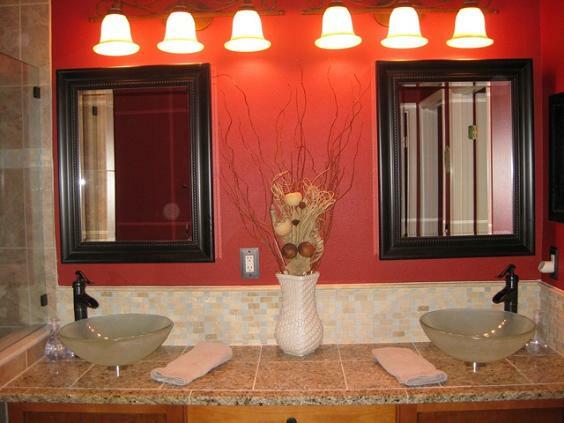 And to complete it they had 2 half inch thick glass bowl sinks installed on the granite top with brushed antique brass contemporary faucets. 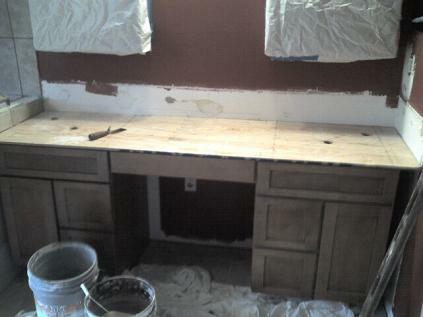 I hope you like the pictures below and the final shots of the counter top and shower. 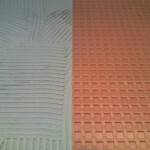 Ceramictec was referred to us by a friend who was very pleased with their work. Brain was great to work with and is very meticulous in his quality of work. As with any home, walls are not straight. 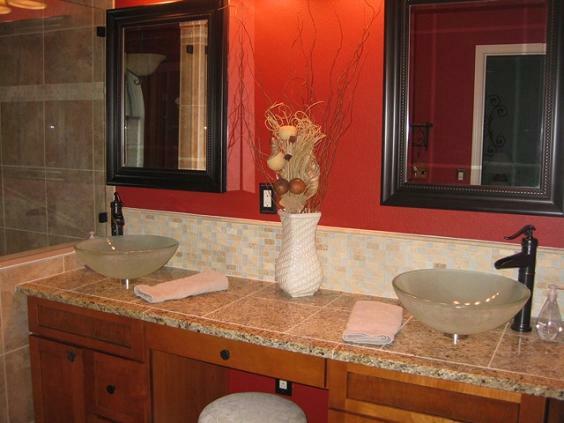 His grout lines were spot on and the bathroom looks amazing! 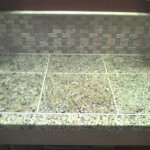 I am very pleased with his work and would highly recommend him and his company to anyone needing a tile job. It takes a lot to meet my expectations. 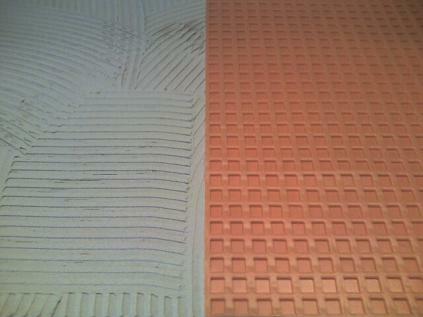 Ceramictec not only met them, but exceeded them! 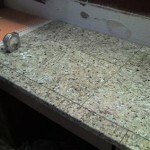 this post is very useful, especially seeing the Ditra done on the counter.. thx! 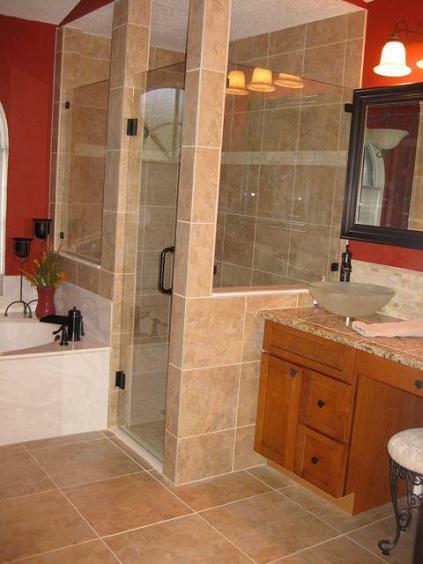 This was an awesome shower room makeover. The details were plainly explained, very informative and interesting. Your article was very interesting and informative. Thanks for the tips & great photos explains the install. I was happy to find your post, nice article and finished job. 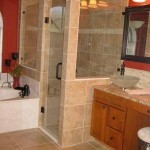 Previous post: Accessible Handicap Barrier Free Shower Tampa, FL.